To provide first hand information of how and where real India lives, students are involved in community services programmes under National Service Scheme. N.S.S Volunteers are required to devote 120 hours to social service programmes and regular activities organized during the session. At present, N.S.S. unit of 95 volunteers is running smoothly under the skilful guidance of Ms. Manju Jain. Certificate of merit is awarded to a volunteer who has completed 240 hours of regular activities in the period of two years and attended Two Annual Special Camps (of at least 10 days duration), one who has donated blood at least twice or has made at least five illiterates literate or one who has done an exemplary act of bravery and awarded at the National level. NSS unit of the college has bagged a project �Polythene -- A bagful of poison� from Kurukshetra University. The project aims at making Jagadhri polythene free. NSS volunteers visit schools, colleges and residential area of the city to create awareness regarding the harmful effects of polythene. 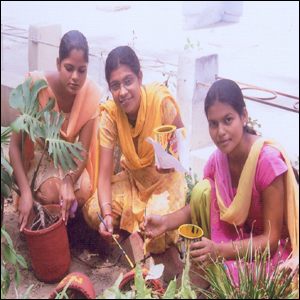 They motivate everyone to use jute, paper and cloth bags to rid our planet of pollutants.